PACKT Publishing made freely available its Skillup Reports: basically, it is a set of comprehensive reports for different technical areas – web development, app development, data development, sys admin – with lots of useful insights on these areas, focusing on skills and salaries. These are available on PACKT’s site, so have a look! The main tool for profiling SQL Server is, of course, SQL Server Profiler. You can, however, achieve more or less the same results using .NET, I’ll show you how. First, you need to have assemblies Microsoft.SqlServer.ConnectionInfo and Microsoft.SqlServer.ConnectionInfoExtended at hand, which are normally found in C:\Program Files\Microsoft SQL Server\120\SDK\Assemblies (for SQL Server 2014), if you installed the Shared Management Objects package from the SQL Server Feature Pack (again, this link is for SQL Server 2014, but there are feature packs for each version of SQL Server). TextData: textual data, like, SQL. One thing to keep in mind is that you need to pass a valid SQL Server Profiler template for the InitializeAsReader method. You can add one of the existing templates to your Visual Studio project, set it to copy to the output folder, and reference it locally, if you prefer, otherwise, you will need to know the full path where it is installed (C:\Program Files (x86)\Microsoft SQL Server\120\Tools\Profiler\Templates\Microsoft SQL Server\120 is for SQL Server 2014). This one is a classic: the SharePoint Publishing feature in a Publishing Site creates a document library by the name of Pages; this is where you can store your publishing pages. A common request is to have more of these document libraries, that is because we cannot create publishing pages anywhere else. The problem is, it is unsupported, God knows why! Now, there are some solutions over the Internet that claim to go around this limitation, but none of them is supported, so proceed with care! Apparently, I am the last ASP.NET Web Forms developer in the whole World, which makes me kind of sad… anyway, after much crying, I decided to try out something: a comparison of Web Forms and MVC to solve a real life problem! Now, I only needed a problem to solve… Then, a colleague of mine came questioning me about captchas, so I thought, why not use it as my example? And here we are! Everyone is familiar with captchas. They are a way to prevent the automated use of web forms, so as to make sure that it is indeed an human that is providing the information. There are lots of implementations out there, and I don’t claim that mine is better or worse, I just implemented it in a couple of hours as an exercise. A succinct description is in order. The contract for storing a secret key. Defines two methods, Store and Retrieve. An implementation of CaptchaSecretPersister that stores the secret key in the ASP.NET session. The contract for transforming an image. Only has a single method, Transform. Inherits from CaptchaImageTransformer, but doesn’t do anything. The contract for generating a new secret key (GetSecret). An implementation of CaptchaSecretGenerator that generates a series of random letters. Base class for producing an image with a given secret key, dimensions, colors and an optional image transformer. Only has a single method, GetImage. An implementation of CaptchaImageProducer that uses GDI+. Base contract for secret key validation. Only defines a method, Validate. A case-insensitive string comparison implementation of CaptchaSecretValidator. Actual implementations are sealed, stateless, and therefore define a static read only field, to avoid multiple instantiations. Both implementations, Web Forms and MVC, will use these classes. The CaptchaImage class inherits from WebControl, so that we can leverage some of its properties (ForeColor, BackColor), and defines a containing tag of IMG. ControlToSetError: an optional ID for a control that can take text (must implement ITextControl too), which will be used to set the ErrorMessage value. The IsValid property, from IValidator, is implemented privately because most of the time we do not want to mess with it. 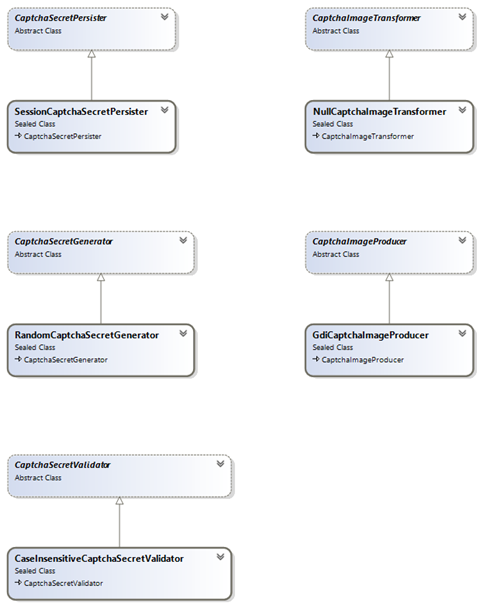 Another inherited property, Enabled, can be used to turn off validation. ValidationComplete: always raised when a validation is performed, regardless of its outcome. When the control loads, OnInit is called, and it registers itself with the Validators collection, this is a required step. In Render, it generates a secret key, stores it, produces an image from it and renders it as an inline image using the Data URI format. It is the same approach that I talked about a number of times before. When the control receives a validation request, the Validate method is called, and the provided key is validated against the stored one. Easy, don’t you think? Now, let’s move on to MVC! The code from Unity.Mvc automatically hooks Unity with the DependencyResolver class, so we don’t have to do it ourselves. For an example implementation, I once wrote a post on it that you can check out, if you are curious. As you can see, the form will post to the Validate method of an HomeController. The output of the Captcha method doesn’t have to be inside the form, because it merely renders an IMG tag. It tries to obtain the services from the DependencyResolver, validates the supplied secret key and then returns the proper view, accordingly. So, which implementation do you prefer? The Web Forms one, unsurprisingly, only needs a single class, CaptchaImage, and, of course, a host page; the assembly containing it can be referenced by other projects and used very easily. As for the MVC version, we need to have the Captcha extension method, the IoC bootstrapping/registration code, a view and a controller with a Validate method similar to the one presented. The extension method and the controller may come from another referenced assembly, it needs some work, but can definitely be done. Of course, this is a sample implementation, things can be done in a myriad of alternative ways. I’d like to hear from you about the problems with this particular implementation, and alternative ways to do it. By the way, feel free to use and modify the code anyway you want to, I will soon make it available in my GitHub account. I was again asked by Packt Publishing to review one of their books, this time, it was Automating Microsoft Azure with PowerShell. It came in good time, because I am starting to use Azure more and more, and PowerShell is a timesaver – actually, it is the only way to do lots of things. I have reviewed other books on Azure, which you can find at my blog, here. The book starts with an introductory chapter, where PowerShell and Azure are introduced, and then goes to the real thing. Not all APIs are covered, namely, Machine Learning, DocumentDB, BizTalk, Stream Analytics, etc, etc, which is not really surprising, since it seems that every month a new service pops out. The book is ~150 pages long, distributed between 10 chapters, which is perfectly acceptable for the amount of topics it covers. The target audience is clearly administrators with little knowledge of Azure. The author is John Chapman, which can be followed at Twitter as @chapmanjw. This chapter offers an introduction to PowerShell and how to install the Azure integration, retrieve subscription files and connecting to Azure. At the end of it we see how to create a blank website using PowerShell. This one is about storage. It explains about the major storage options that Azure has to offer – Table storage, Blobs, Queues and Files. Basic operations are discussed and we are presented with an example of a backup system. Next we have a discussion of the APIs available for the management of virtual machines (VMs). We learn how to create the many kinds of VMs existing in the Azure gallery, and performing all the typical operations, including creating snapshots and managing its storage. In this chapter we learn how to create SQL servers and databases, configuring access to them, executing queries and finally exporting and importing data to and from. Chapter 5 is about Azure Websites, the old name for Azure Web Apps. We learn how to create websites and how to provision them. Here I got the feeling that a lot is missing. A short chapter on how to configure virtual networks. Again, a lot more could be said on this. Azure Traffic Manager is Azure’s load-balancing mechanism. It explains how to configure websites for using the different load balancing techniques and load balancing profiles. Cloud Services is another way to host VMs. The chapter explains how to create and manage cloud services, roles and endpoints and how retrieve Remote Desktop connection files. This chapter explains the basics of the Azure Active Directory (AD), the main authoritative source of identities in an Azure virtual network. We learn how to create and configure the basic options of an AD, managing users, groups and password policies. The example at the end of the chapter is about bulk creating users in the AD. The final chapter talks about one of the automation mechanisms in Azure. We learn how to create an automation account and how to add runbooks to it. The book is very succinct, and some topics would require substantially more coverage. It does provide some information enough to cover the basic usage of the covered Azure services.